Summer was a very busy time for JCBT. Many groups of Bible Translators, Bible consultants and other personnel visited the Land of the Bible through the various JCBT programs, learning the Text of the Bible in its original Context. 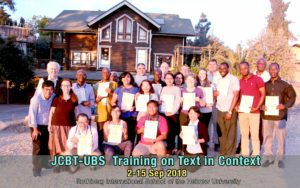 Beginning on July 15, JCBT had the joy of welcoming a group of 20 Angolan Bible Translators working with UBS (United Bible Societies) to experience the text and context of the Bible here in Israel. A completely unique course offered in Portuguese, the 2-week program was part of an intense 2-year training through the United Bible Societies (UBS) led by Dr. Riikka Halme-Berneki and Dinis Ezequiel . During their stay in the Land of the Bible, they were encouraged, challenged, and equipped to take their newfound knowledge back to Angola and influence their translation projects. Immediately after, Spanish-speaking translators from UBS Latin America journeyed to study with JCBT beginning July 29 and running through August 11. This group of 21 translators represented five different Central and South American countries: Argentina, Mexico, Peru, the Dominican Republic, and Ecuador. Designed specifically for them with the oversight of Dr. Esteban Voth, this Spanish course introduced the translators to the Land and further prepared them for the task of translating the Scriptures rooted in the physical context. Arriving on August 5, we had an exceptional group of five New Testament translation consultants from The Seed Company (plus two others) come for a month of intense study led by Bob Carter and Brian (Baruch) Kvasnica. These high-level students focused specifically on improving their Hebrew through Immersion Ulpan Biblical Hebrew classes led by Eyal Nahum and Talia Bar-David, in order to transition to be consultants for the Hebrew Bible. The Hebrew classes also had six other “Hebrew for the Nations” (www.Hebrew4Nations.org) Israeli student teachers observing and briefly teaching. 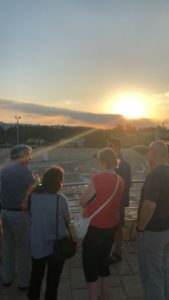 The days were filled with immersive Hebrew, as well as many field trips significantly taught in “easy Hebrew” emphasising Hebraic culture, archaeology and historical geography in the Land of the Bible. A group of remarkable Translation Officers from the United Bible Societies were received by JCBT from 2-15 of September with Dr. Robert Bascom and Brian (Baruch) Kvasnica. These English-speaking students represent a staggering 20 different countries! The two weeks were filled with exciting explorations of the country and perspective-changing insights, giving these students an invaluable education into the context of the Bible. We give praise to God for this intense summer and fall season for about 70 Bible Translators and Consultants having the opportunity for so much engagement with Hebrew and the Land of the Bible – Thanks be to God!